Destiny's Child to perform on Jay-Z and Beyonce's On The Run II Tour? Destiny's Child are reportedlly planning to head out on select dates of Jay-Z and Beyonce's 'On The Run II' stadium tour, after reuniting at Coachella earlier this month. Destiny's Child will reportedly perform on select dates of Jay-Z and Beyonce's 'On The Run II' stadium tour. Michelle Williams and Kelly Rowland reunited with the 'Crazy in Love' hitmaker twice at Coachella Valley Music and Arts Festival earlier this month - where Beyonce was also joined by her rapper husband - and now, according to insiders, they are set to do it all again on the run, which kicks off at Cardiff's Principality Stadium in South Wales on June 6, and consists of 48 dates worldwide. 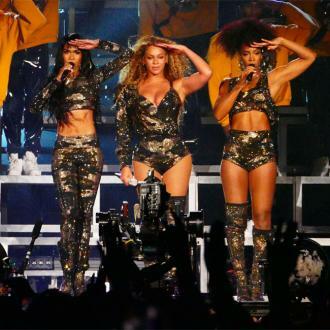 A source told The Sun newspaper: ''Beyonce worked tirelessly on her Coachella headline performance but the crowning moment was her medley with Kelly and Michelle. They really enjoyed working together again after so long and now Bey is keen for them to be part of 'On The Run II'. ''The girls have their own work commitments and families but could fly out for certain dates to surprise fans because they're all aware of the demand for a reunion. Whilst the 'Survivor' hitmakers - who split up in 2006 and last reunited for a live performance in 2015 - don't look set to reunite full-time for their fans, Michelle recently said now they all live close to each other they are able to hang out more often. She said: ''I just moved to Los Angeles full-time in January, and I'm so happy to finally move to where the girls are. The 37-year-old singer admitted it's overwhelming knowing that fans are still demanding new music and shows out of the 'Say My Name' group, 14 years after their last record, 'Destiny Fulfilled', was released. Speaking about joining Kelly during Beyonce's set at the music festival in Indio, California, she said ''Let's call it a blessing. Beyoncé and Kelly - they've been in the game for, what, 23 years?